The tournament consists of two parts. Participants of the tournament will shoot at target surfaces, silhouettes and target zones. In the first half of the tournament, shooting distance increases while the shooter stands in the same place. In the second half, shooting distance decreases while the shooter is moving closer to the target. Participants of the tournament have to undergo a security check where they have to present their secure equipment to the organisers of the tournament. Presented secure bows are certified with a sticker. Throughout the tournament participants have to comply with the Safety Regulations of the Hungarian Archery Association. Participants can shoot a maximum of 7 arrows at each station. The participant who has taken command of his station can have no more than 7 arrows with him. Participants have a maximum of 3 minutes at their disposal to shoot the first series of 7 arrows. Only those participants that are momentarily shooting are allowed to stand at the shooting station. Participants who have already shot their arrows or are preparing for their next shot are asked to stand behind the waiting line. Shots are evaluated once all the arrows have been shot. During the evaluation process only the recording personnel and their assistants are allowed to touch the arrows. Only the recording personnel and their assistants are allowed to stand in the target zone. Only the members of the organising association are entitled to stand behind the target zone. It is forbidden to tour the shooting ground. Fair play is guaranteed by the organising association. The breaking of any of these rules can lead to disqualification from the tournament. Select a location, map the area. The area must have clear visibility, be orderly flat, and it is recommended to have for example a football pitch. Considering the safety zones, the minimum size of the ideal field is 70 meters x 150 meters. The field is marked with red flags. When choosing a venue, the nearby parking space, a women's and men's toilet, a medical first aid room, or tent and a qualified person will be considered. Select 0 points (firing line). Carving on the two edges of the track, including a slip, with a ribbon marking the shoot line. Select a waiting line at least 3 meters behind the line. Only the competitor can stand in a shoot line. From the shooting line, mark the places of the target from 40 meters, 60 meters, 80 meters, 100 meters, 120 meters with poles. At 50 and 100 meters, red wind-warning flags shall be placed on the line of the track. 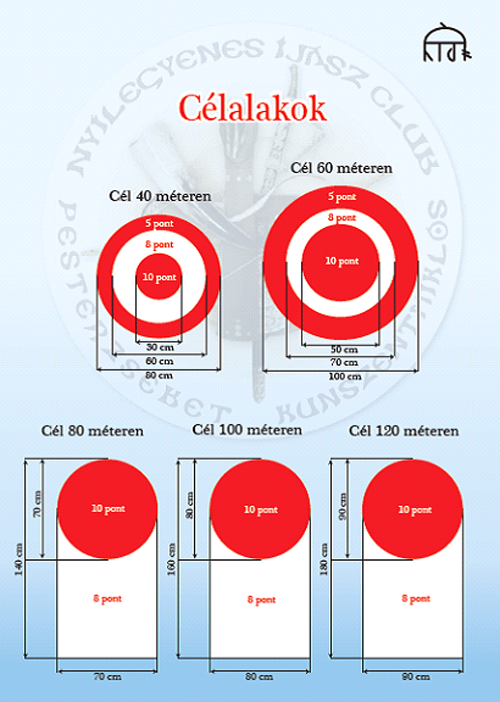 At 40 and 60 meters, targeting is not a target zone designation. 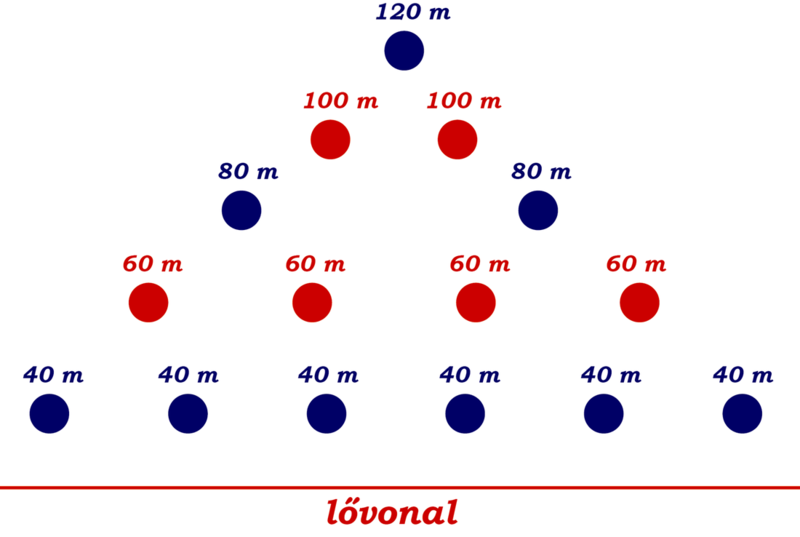 At 80 meters and above it is necessary to create target zones outside the target area as follows. Depending on the measured distance, we draw a circle with a paint spinner or other visible line. Place the target in the center of the circle thus formed. Different distances are assigned to different target zones. Place the target shapes at 15 degrees to the ground. The available scoring is 0-5-8-10 points on each target surface and target zone. Shots outside the target area or target zone are worth 0 points. The inner circle is 10 points, the outside circle is 8 points, the outer circle from 60 meters and the target zone is 5 points. VATA Target Sheet: 30 centimeter diameter inner circle (10 points), 60 centimeter diameter center circle (8 points) and 80 centimeter diameter outer circle (5 points). The target sheet is placed on a stand 80 centimeter from ground level. VATA Target Sheet: 50 centimeter diameter inner circle (10 points), 70 centimeter diameter center circle (8 points) and 100 centimeter diameter outer circle (5 points). The target sheet is placed on a stand 80 centimeter from ground level. The appearance of target zones changes the shape of the target. Shots within the circle at the top of the target are worth 10 points and the surface color is red. Except for the cut-off area of the top-round half circle, the surface of the 8-point hit, the surface color is white. Results within the target zone will always be 5 points. The target is placed directly at the ground level, tilted backwards to 15 degrees from the ground. Total height of the target is 140 cm, width 70 cm. The 70 cm diameter circle is 10 points, the remainder of the target figure is 8 points and the target area of 6 meters in diameter is 5 points. Total height of the target is 160 cm, width 80 cm. The 80 cm diameter circle is 10 points, the remainder of the target figure is 8 points and the target area of 8 meters in diameter is 5 points. Total height of the target is 180 cm, width 90 cm. The 90 cm diameter circle is 10 points, the remainder of the target figure is 8 points and the target area of 10 meters in diameter is 5 points. ​The results are evaluated in the target circles as usual, and in the target zones, the position of the arrowhead is relevant. The edge of the arrowhead within the line that is clearly visible on the boundaries of the zone boundaries is worth a hit. ​The success of a competitor is determined by the aggregate score of the "distant" and "approaching" score of the shooting. During the evaluation, the competitor named by the scorer must help the scribe identify the arrows, listing their results, which the scorer checks in parallel. If the named competitor does not cooperate with the evaluation after 3 consecutive calls, the given scores of the competitor will be introduced with zero, ie zero points. Non-centered, traditional bows, longbows. (not hunting bows). The bows must comply with the rules of the Hungarian Archery Association Historical Section in terms of their material and form. The hunting reef category is accepted as a guest category, with all types of mid-shot bows. The arrow must have a wooden body, a practicing tip and a bird's feather, plastic nocks (must also comply with the rules of the Hungarian Archery Association's Historical Section). The competitors name must be written by the contestants in a legible manner with their own name. For smooth competition, at least 10 same painted arrows, with their own name on it is necessary for the contestants. ​Due to the distance, we are not permitted to accept competitors under 15 years of age, with the exception of a written confirmation of the competitor's coach. ​Every fire task is to be supervised. Bad visibility, in fog or in the dark, remote shooting is forbidden! Use of arm and hand protection is absolutely recommended! Plain gloves, mittens, y-gloves, or similar wear can be worn on the bow hand, but they can not be attached to the bow's grip. Enabling the use of a personal protective equipment is the task of the competitor, the main criterion of authorization being that a protective device may be used, but the aid is excluded. ​Competitors in the first three places in each category receive a medal, and a diploma (fourth to sixth places recieve a diploma). ​Along with the efforts of the Historical Section of the Hungarian Archery Association, we will also award a team competition. Associations that are able to exhibit at least 4 archers can participate in a team competition with one team per club. The score of 4 archers who score most points will be included in the team's score.